Bottles can provide a lot of information about where and how they were manufactured as well as the manufacturer and contents. 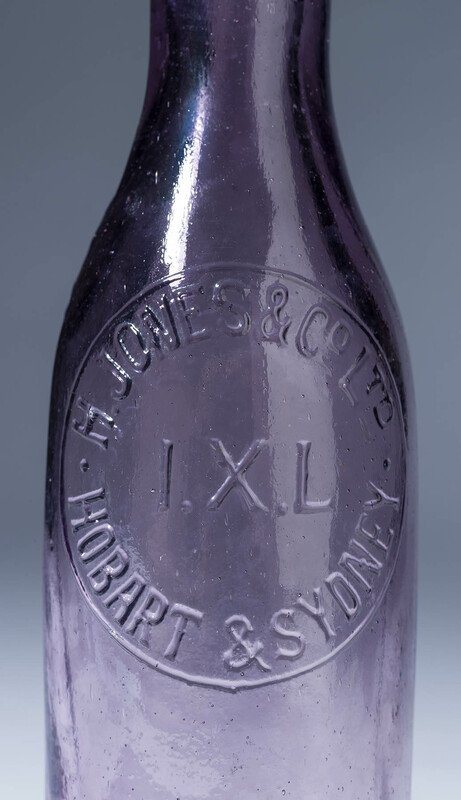 This bottle contained sauce manufactured by the Henry Jones IXL company established in 1891 in Hobart. The IXL brand became a leading Australian brand associated with jams, sauces and conserves. Archaeologists often recover fragments of pickling jars, lamps and window glass, glass ornaments, drinking glasses, bowls, candlestick holders. The shape, colour and manufacturing techniques are very useful ways through which to identify the original form of broken glass, however, glass doesn’t always have the same identifiable decorations or manufacturer’s marks as other historical items like ceramics. Many glass containers were mass produced to the same specifications in glass factories across Australia and the world, so they can be difficult to provenance. Archaeologists are reliant on the form, brand name and traces of manufacturing techniques on fragments, to understand where glass products came from and what they may have been used for. Bottles in particular can be problematic. Their contents were traded long distances and the bottles were recycled for multiple purposes. At the end of their useful life, glass containers may have been discarded a very long way from where they were originally manufactured. So why are they so common and why are they important for archaeologists to recover and record? 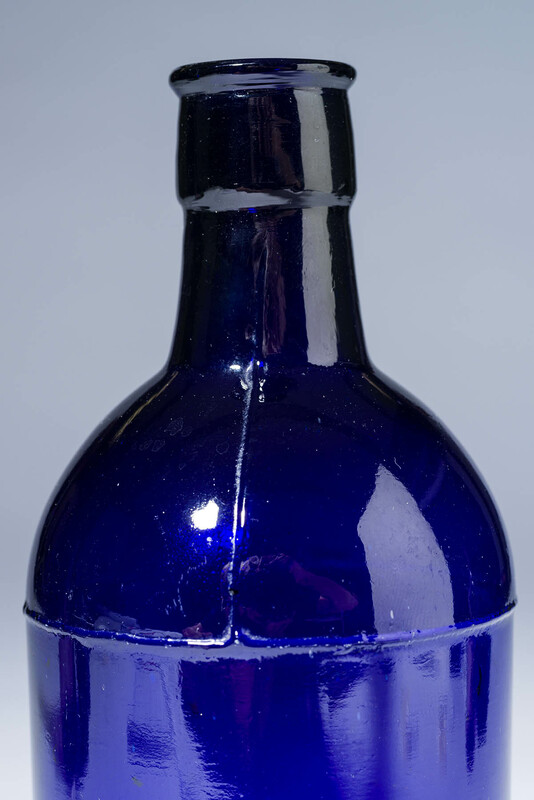 Pharmaceutical bottle, cobalt blue, three-part mold bottle with straight sides, rounded shoulders and short neck. The key to the high distribution level of glass across Australian historical archaeology sites lies with its durability and common usage. Although glass is a brittle material that can snap and break easily, glass does not react as strongly to chemical wearing as organic material like clothing, bone and leather items do. The broken fragments of ceramic and glass found across a site can provide us with a wealth of information about the people at that site – especially when all the fragments are analysed as a whole. They can tell us an approximate time span of occupation of the site, where different groups of people lived within a site, the food and beverages preferred by the people, how wealthy they were to afford the things they used and consumed, whether items were imported and from where, the level of healthcare within the community and the connectedness of the community to other communities. We can then begin to ask questions about the lives and the cultures of communities occupying sites and then infer further information about those people. For example, if we consider a site that was occupied by people of predominately English heritage, we may ask if they prefer imported things from the UK, and wonder whether an item from home made the distance feel a little less, or if they recycled containers ? By asking related questions and through careful analysis of artefacts and long hours of research, archaeologists can build very detailed insights into past people’s lives and cultures. Join us as we celebrate National Archaeology Week with our special daily lunch time Meet our Curator sessions in the Discover Centre. Meet Nick today for his talk ‘The Archaeology of Bottles’ at 1pm – 2pm.